Morgan Walls, M.D., a second-year resident in Pediatrics at Vanderbilt University Medical Center, has been named an Academic Pediatric Association (APA) New Century Scholar. In an effort to increase workforce diversity in academic pediatrics, the APA has created a mentorship program targeting under-represented minority (URM) pediatric residents interested in academic careers. URM is defined as a group whose representation in medicine is less than that in the general population. Walls and five other residents from across the country were named to the Class of 2014 New Century Scholars. Each participant is interested in racial/ethnic health disparities, minority child health and development, sociocultural determinants of health and cultural competency. “This program is a real opportunity for mentorship,” said Walls. “It will be great to meet with others who are interested in pediatrics, health disparities and increasing minority recruitment and diversity within medicine. “The selection of Dr. 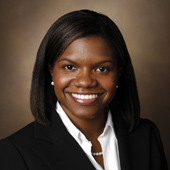 Walls for this highly competitive position serves as a means to potentially keep her in the pipeline for an academic faculty position,” said Andre Churchwell, M.D., senior associate dean for Diversity Affairs at Vanderbilt University School of Medicine.